The Ishinomaki and Rikuzen Takada meadow projects are a success! They are blooming very well and the local people are coming to enjoy them. Everyone’s reaction is so emotional and warm. Visitors and volunteers, both were moved to tears at the glorious mass of flowers. Many people said it was impossible to create a mixed flower meadow anywhere in Japan, and absolutely impossible on such awful soil, full of rubble, full of salt, devastated by the tsunami. But with the help of many volunteers, we did it! We named the Rikuzen Takada, Iwate, meadow area “Kiseki no Oka”, in English it means, “Miracle Hill”. At “Wata-no-ha Garden”, the site in Ishinomaki, Miyagi, the flowers bloomed a little earlier and Wata-no-ha Garden has been receiving visitors from all around Sendai. It is on the main road through the area and many people stop off to see the flowers, as they drive past. Local people whose houses were damaged by the tsunami say they are moved beyond words. They are eager to join the 3.11 Garden Charity project and make similar flower meadows next year. 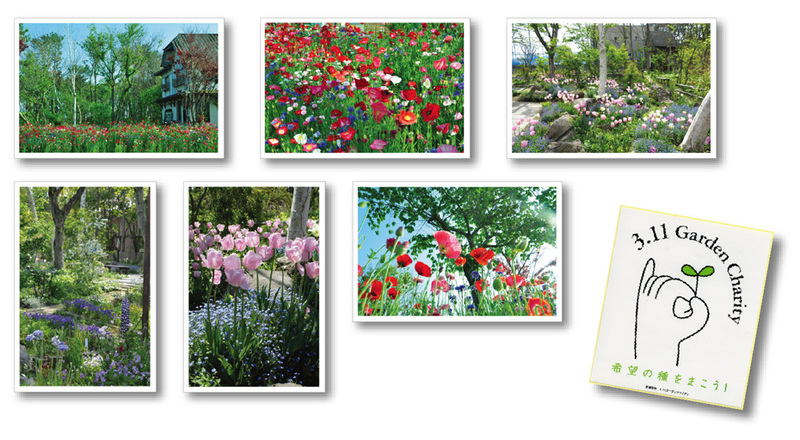 We are selling postcard sets of the tulips, and flower meadow at Wata-no-ha Garden to raise money for next year’s 3.11 Garden Charity projects. Thank you very much for all your support. Many people have expressed an interest in continuing the project next year, too. Let’s join together and make it even better. I am so impressed and thankful, not only to the volunteer workers who toiled on the land, but also to the Open Garden groups all over Japan who raised money to support us. Thank you. I hope this news will encourage many people. We will make a big feature story on Wata-no-ha Garden in the BISES July 2012 issue, and on Kiseki no Oka , in BISES’ September 2012 issue. The "3.11 Garden Charity" has been set up to raise money for the victims of Earthquake and Tsunami in Japan. We aim to help the garden lovers of the Tohoku region to re-build green areas destroyed on March 11th 2011. We believe that gardening can help to provide hope for people coping with difficult times in their life. 1. Recover garden areas by planting young trees and redeveloping the destroyed landscape. 2. Care for the children affected by the disasters by organising special events such as days out and garden visits. 3. Plant flowers and trees in the affected roads and neighbourhoods. We want to bring the joy of flowers and greenery back into their lives. Please help us. We are grateful for any contributions, no matter how small. Hanako Yagi is the editor in chief of BISES, an award winning English style Garden magazine in Japan. In 2011, BISES celebrated its 20th year of publication. In 2009, BISES sponsored the IGPOTY competition. Copyright c BISES, Ltd. All Rights Reserved.